If only Hillary Clinton had become president, some believe, the United States would have guided the world toward a better future. There is no question that Trump places little value in democracy. However, it is a mistake to see him as the sole cause of the world’s problems. Our present troubles were caused by the decisions made by the administrations of former Presidents Bill Clinton, George W. Bush, and Barack Obama. A recurring theme of foreign-policy commentary since 2016 has been the prior status and uncertain future of the so-called liberal order. Some writers question whether a liberal order ever existed or challenge its alleged virtues, while others are quick to defend its past achievements and bemoan its potential demise. 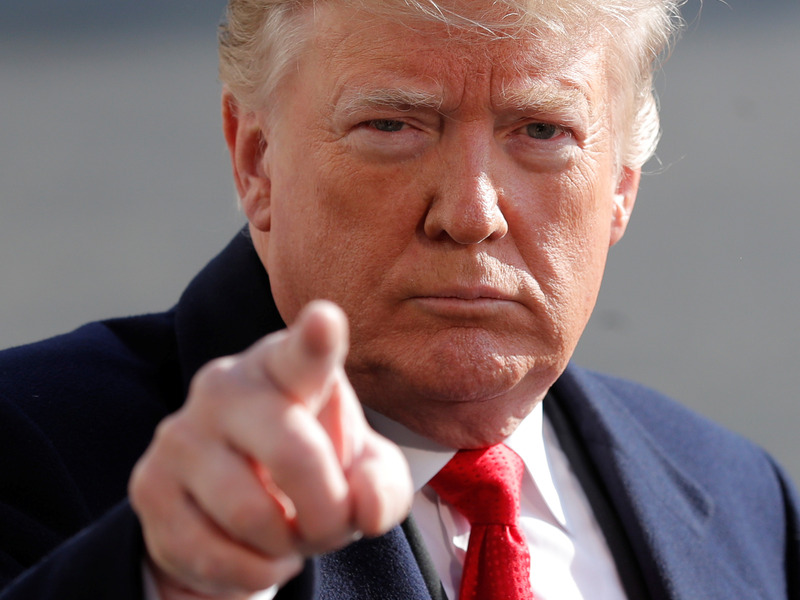 If there is a consensus among these various commentators, however, it is that US President Donald Trump poses a particular threat to the US-led, rules-based order that has supposedly been in place since 1945. If only Hillary Clinton had become president, some believe, the United States would have remained the “indispensable nation” guiding the world toward a more benign future, and the familiar elements of a rules-based order would be thriving (or at least intact). There is no question that Trump places little value in democracy, human rights, the rule of law, or other classic liberal values, and he seems to have a particular disregard for America’s democratic partners and a soft spot for autocrats. But it is a mistake to see him as the sole — or even the most important — cause of the travails now convulsing the US-led order. Indeed, the seeds of our present troubles were sown long before Trump entered the political arena, and are in good part due to foreign-policy decisions made by the administrations of former Presidents Bill Clinton, George W. Bush, and Barack Obama. 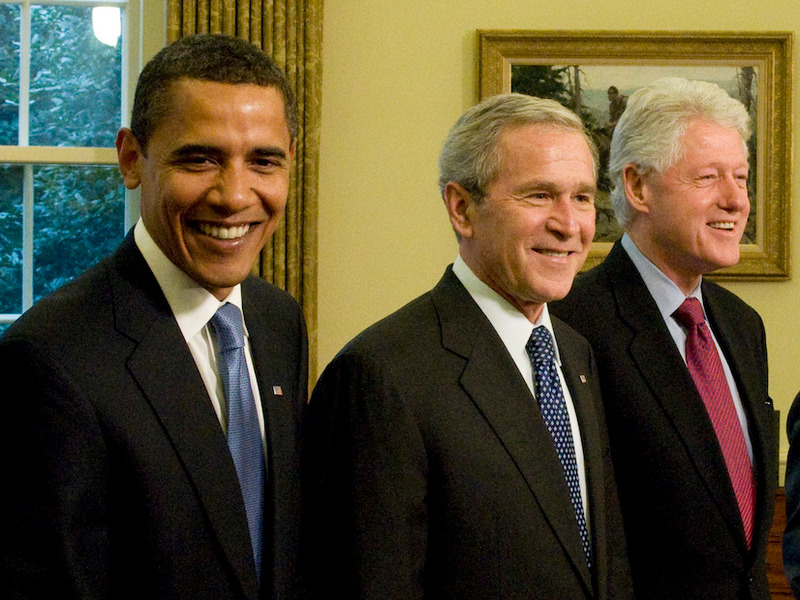 US President George W. Bush (C) meets with President Barack Obama (2nd-L), former President Bill Clinton (2nd-R), former President Jimmy Carter (R) and former President George H.W. Bush (L) in the Oval Office January 7, 2009 in Washington, DC. Having triumphed over the Soviet Union, the United States could have given itself a high-five, taken a victory lap, and adopted a grand strategy better suited to a world without a superpower rival. Rejecting isolationism, Washington could nonetheless have gradually disengaged from those areas that no longer needed significant American protection and reduced its global military footprint, while remaining ready to act in a few key areas should it become absolutely necessary. These moves would have forced our wealthiest allies to take on greater responsibility for local problems while the United States addressed pressing domestic needs. Making the “American dream” more real here at home would also have shown other nations why the values of liberty, democracy, open markets, and the rule of law were worth emulating. This sensible alternative was barely discussed in official circles, however. Instead, both Democrats and Republicans quickly united behind an ambitious strategy of “liberal hegemony,” which sought to spread liberal values far and wide. Convinced that the winds of progress were at their back and enamored of an image of America as the world’s “indispensable nation,” they set about using American power to topple dictators, spread democracy, sanction so-called rogue states, and bring as many countries as possible into security institutions led by the United States. By 2016, in fact, America was formally committed to defending more foreign countries than at any time in the nation’s history. America’s leaders may have had the best of intentions, but the strategy they pursued was mostly a failure. Relations with Russia and China today are worse than at any time since the Cold War, and the two Asian giants are once again colluding against us. Hopes for a two-state solution between Israel and the Palestinians have been dashed, and the rest of the Middle East is as divided as it has ever been. North Korea, India, and Pakistan have all tested nuclear weapons and expanded their nuclear stockpiles, while Iran has gone from zero enrichment capacity in 1993 to being nearly a nuclear weapons state today. Democracy is in retreat worldwide, violent extremists are active in more places, the European Union is wobbling, and the uneven benefits of globalization have produced a powerful backlash against the liberal economic order that the United States had actively promoted. All of these trends were well underway long before Trump became president. But many of them would have been less likely or less pronounced had the United States chosen a different path. A soldier of the Polish Army sits in a tank as a NATO flag flies behind during the NATO Noble Jump military exercises of the VJTF forces on June 18, 2015 in Zagan, Poland. 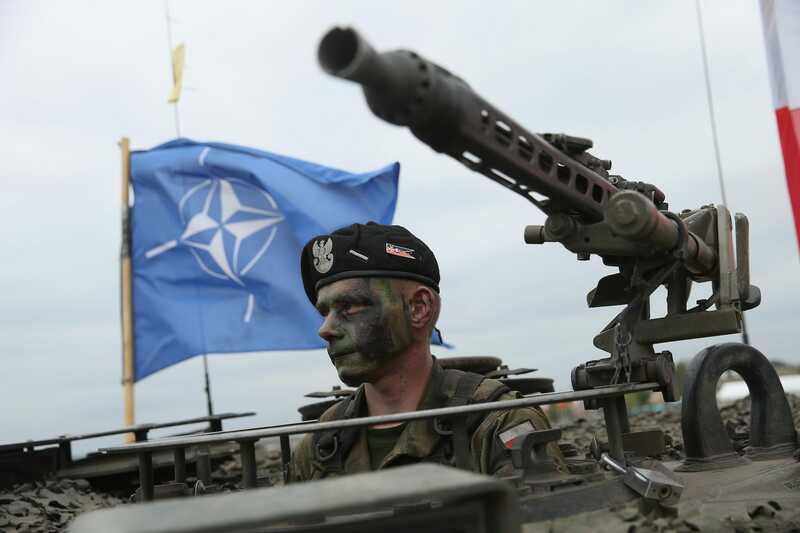 In Europe, the United States could have resisted the siren song of NATO expansion and stuck with the original “Partnership for Peace,” a set of security arrangements that included Russia. Over time, it could have gradually drawn down its military presence and turned European security back over to the Europeans. Russia’s leaders would not have felt as threatened, would not have fought Georgia or seized Crimea, and would have had little or no reason to interfere in the US election in 2016. As the European Union took on a greater security role, states like Poland and Hungary might have been less inclined to flirt with authoritarianism under the safety blanket of US security guarantees. A wiser United States would have let Iraq and Iran check each other instead of attempting “dual containment” in the Persian Gulf, eliminating the need to keep thousands of US troops in Saudi Arabia after the first Gulf War. 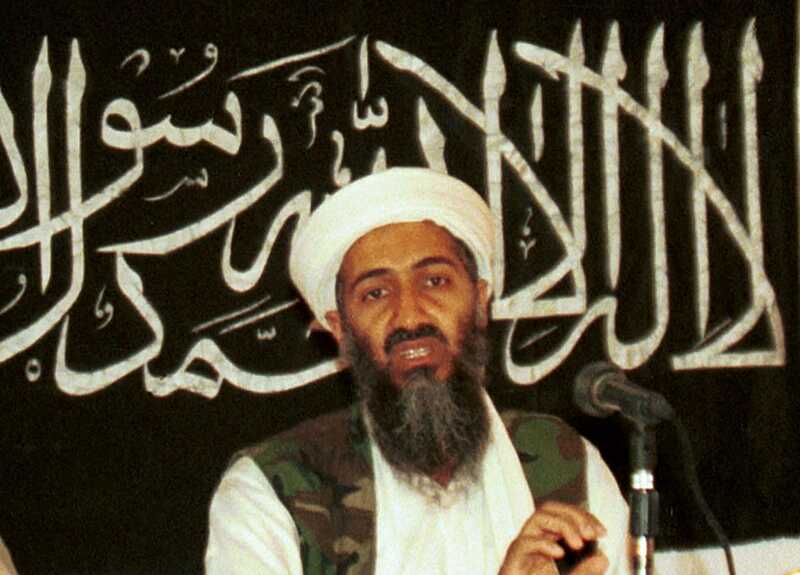 Had Washington also made its support for Israel and the Palestinian Authority conditional on both sides making steady progress toward “two states for two peoples,” the two principal sources of Osama bin Laden’s murderous antipathy toward America would have been removed, making the 9/11 attacks much less likely. And with no 9/11, we almost surely would not have had invaded and occupied Iraq or Afghanistan, thereby saving several trillion dollars and thousands of US and foreign lives. The Islamic State would never have emerged, and the refugee crisis and terrorist attacks that have fueled right-wing xenophobia in Europe would have been far less significant. A United States less distracted by wars in the Middle East could have moved more swiftly to counter China’s growing ambitions, and it would have had more resources available to accomplish this essential task. Instead of naively assuming that a rising China would eventually become democratic and willingly abide by existing international norms, the United States could also have made Beijing’s entry into the World Trade Organization contingent on it first abandoning its predatory trade practices and establishing more effective legal institutions at home, including protections for intellectual property. Moreover, greater attention to how the benefits of globalization were distributed would also have reduced inequality in the United States and tempered the polarization that is ripping the country apart today. And as Rosella Zielinski argues in a recent article in Foreign Affairs, financing foreign wars by borrowing money (instead of by raising taxes) lets the wealthiest Americans off easy and even allows them to earn interest lending to the federal government, exacerbating existing economic disparities. In this way, an overly ambitious grand strategy helped make economic inequality worse. Finally, a more restrained grand strategy would not have tempted US leaders to use torture, extraordinary rendition, targeted killings, unwarranted electronic surveillance, and other betrayals of core US values. It would also have freed up trillions of dollars that could have been spent strengthening our armed forces, providing better health care for US citizens, rebuilding America’s crumbling infrastructure, investing in early childhood education, or reducing persistent deficits. To be clear: to say that our strategy has been mostly a failure is not to say that the United States failed at everything, or to suggest that the world would be perfect today had US leaders chosen differently. But when one looks back on what the pursuit of “liberal hegemony” has wrought, there can be little doubt that a different approach would have left the United States (and many other countries) in much better shape today. And the liberal order that many are now desperate to save would be in much better shape. Nor is it implausible to imagine one additional benefit: Trump would not be president. Back in 2016, when he called US foreign policy a “complete and total disaster,” a lot of Americans nodded in agreement and cast their votes for him. Unfortunately, his erratic, incompetent, and needlessly combative handling of foreign affairs has succeeded only in making America less popular and influential, without reducing any of its global burdens. The United States is still “nation building,” still waging wars in far-flung locales, still spending more on defense than the eight next largest militaries combined, and still subsidizing numerous wealthy allies. Defenders of our past follies now bemoan Americans’ reluctance to support the same overweening global strategy that produced so many disappointments. But the public has every reason to reject an approach to the world that has repeatedly failed, and to demand a better alternative. Some voters mistakenly believed they would get it from Trump, but he hasn’t delivered and almost certainly won’t. The question remains: what — and whom — will it take before the American people get the more restrained foreign policy they want and deserve? Trump’s trade war is getting serious — here’s why it started, what it means for the US economy, and how it could hit you.